Railway Mission, the Christian charity that cares for rail staff, has boosted its chaplaincy team in response to rising demand from the industry. The charity, which offers a confidential listening ear and spiritual guidance to workers in all levels and sectors of the rail business, has welcomed four new team members. Dylis George, John Robinson, Chris Newport and Joshua Shinhmar (pictured) are serving rail employees throughout London and the South-East of England. Through a reorganisation of its national coverage, the charity is also strengthening its pastoral work across the rest of the UK’s railways. Dylis George (39), who lives in the South East of London, is serving staff on all of the Underground’s 249 miles of tracks, which link together 270 manned stations. John Robinson (50) from Kent is helping rail staff in the South East of London, and to the east of the main line between London and Brighton. He is primarily serving employees of the Southeastern and Southern train operating companies. Chris Newport (61), who lives in Gloucester, is covering the West of London and its surrounding areas, out to Oxford in the north and Weymouth in the south. He is spending most of his time with staff at First Great Western. North Londoner Joshua Shinhmar (46) is providing support in the South West of London, and to the west of the main line between London and Portsmouth. He is primarily serving workers at South West Trains and Southern. The new chaplains have increased Railway Mission’s number of regionally-based staff to 18, and further appointments are due to be made in the coming months. 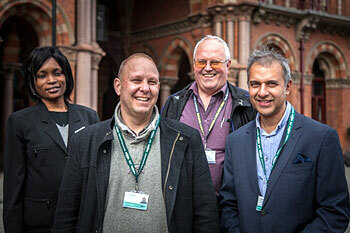 All of the chaplains support train company and Network Rail staff, as well as British Transport Police Officers. In addition, they are available to staff working for other railway related businesses, and offer support to members of the travelling public in times of distress and anxiety. Railway Mission, founded in 1881, relies entirely on voluntary donations to fund its work. Pictured above: (left to right) Dylis George, John Robinson, Chris Newport and Joshua Shinhmar are ready to support rail staff.